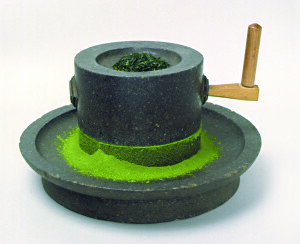 Matcha green tea has been used in the Japanese tea ceremony for more than 800 years. Ancient Japanese physicians called matcha “The Elixir of Life” and used it for longevity. Matcha is made from early spring, green tea buds and leaves. These early spring tea leaves are harvested and then stone ground by hand with granite into a fine powder called matcha. Matcha powder is then whisked, usually with a hand crafted bamboo whisk, into a foaming, delicious drink. Matcha has more theanine than any other tea due to a spring shade growing process. The theanine in matcha green tea puts the brain into a deeply relaxed state called alpha state. One cup of Living Qi matcha can energize, enlighten and relax you for more than 6 hours. The making of matcha is a clear example of natural biotechnology, or growing a plant in a certain way to produce a desired psychosomatic effect. You might call matcha a “mood food” a “functional food” or even a “superfood.” The ancient Japanese did not know that one of the reasons for matcha’s relaxing quality is an amino acid called theanine. Matcha is very high in theanine and scientists are demonstrating this is one of the reasons it can help lower high blood pressure. Theanine is a popular ingredient in supplements designed to put you in a good mood because it enhances alpha brain waves. We believe in getting theanine the way nature intended: in organic tea leaves. Matcha is higher in theanine than any other tea. Are you ready to participate in the matcha green tea revolution? Click here to view products.